We were lucky enough to be part of the trial on the first Ocean Medallion cruise on Regal Princess. 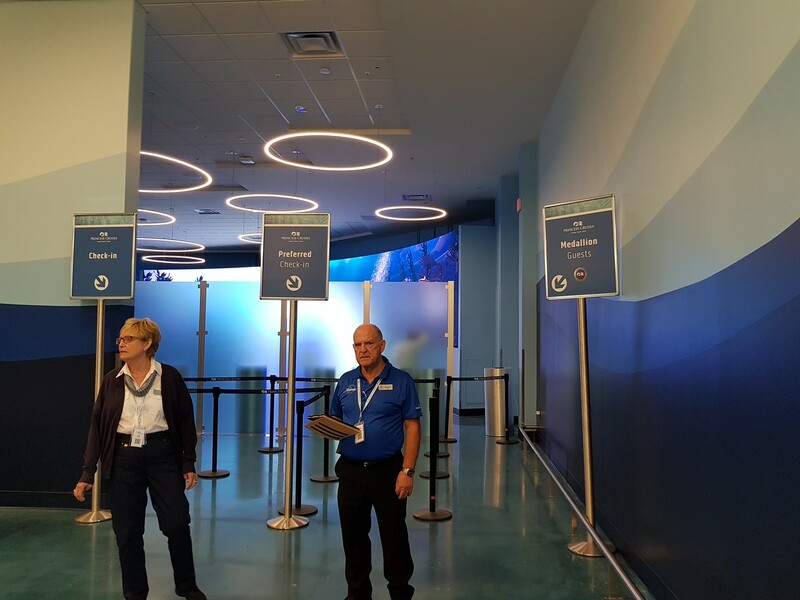 As we were only added to the trial ten days before the cruise departed (plus we were travelling from the UK), we were instructed to pick up our Ocean Medallion at the cruise terminal in Port Everglades. 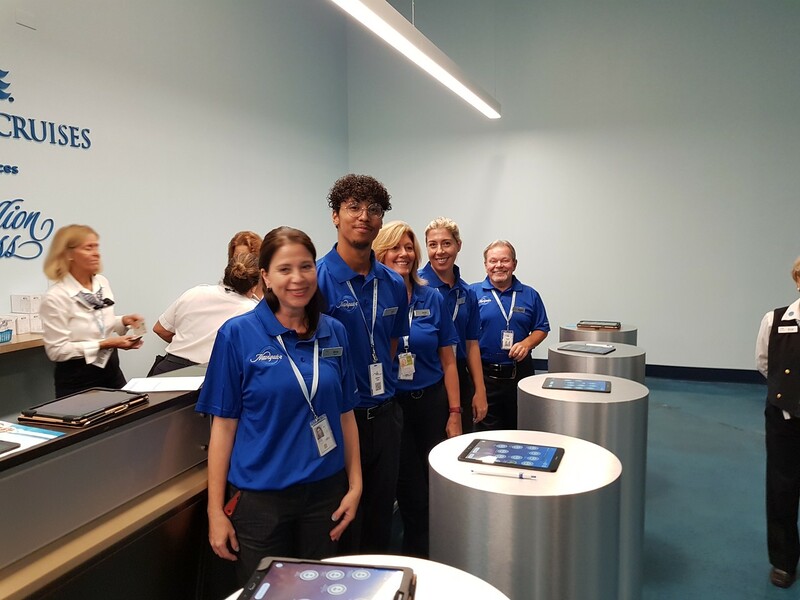 We were aware that Carnival had spent $4 million upgrading Terminal 2 at Port Everglades to become more streamlined so were excited to see the changes. We arrived around 11:20 am and, after going through Security, noticed there were 3 lanes for checking in. Ocean Medallion passengers had their own lane on the right. As we headed for this lane, the man with the tablet looked up expecting to see our names and faces pop up on his screen. We would have been his first customers with Medallions but we were to disappoint him, so he directed us to go through to pick them up. We headed to a counter with lots of eager “Navigators” dressed in blue waiting to check us in. As we were about to leave, Carnival CEO Arnold Donald swept in and greeted us. 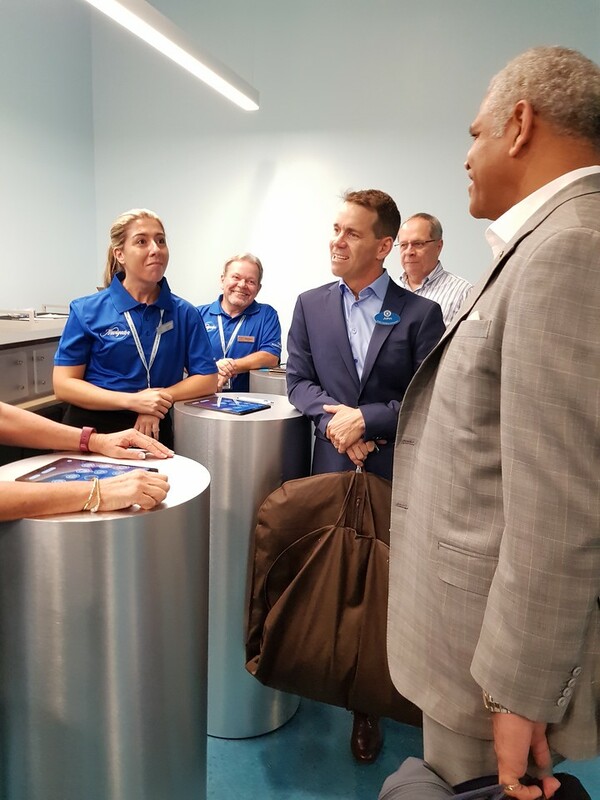 He was accompanied by the Chief Experience and Innovation Officer John Padgett, who we recalled was the person behind the Ocean Medallion project! Clutching our Medallion box, we were directed to an area with a giant LED screen and gracefully declined the chance to have our photos taken. 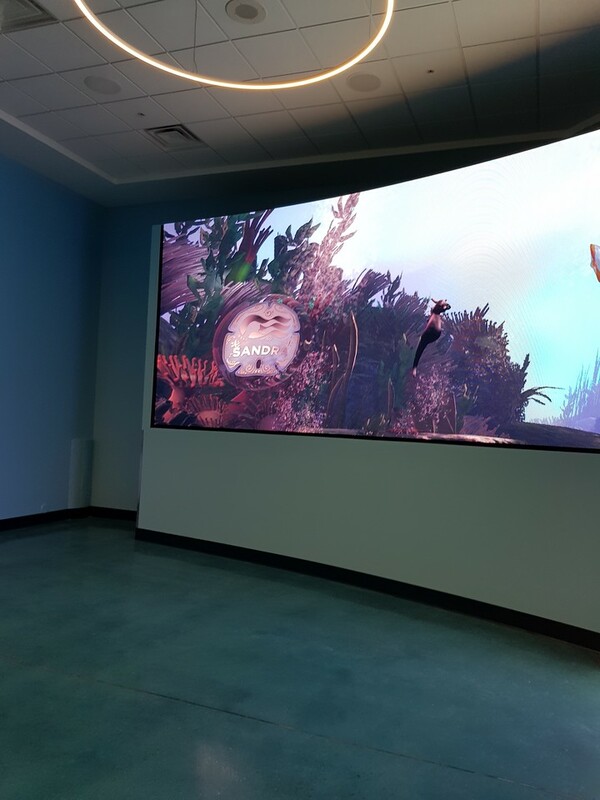 Here we were greeted by more Navigators who explained that our names and Tagalongs should now appear on the screen – and they did! Swimming in and out amongst other names. There was some consternation amongst the Navigators when I said my Seahorse tagalong was not as colourful on-screen as it was on my phone – it showed as dark purple here when I know it was a vivid pink and green so I guess there were still some glitches to work on. We walked through the blue tunnel and sat down with another Navigator to unbox our Medallion and wristbands, put them together and click them on our wrists. The Navigator was also able to explain a lot more about setting up your apps and media devices – fortunately we had already done this so we were good to go. We could now board the ship! We walked up the gangway, ready to walk straight on the ship but were slightly disappointed that we still needed the cruise cards and photos taken to get on. 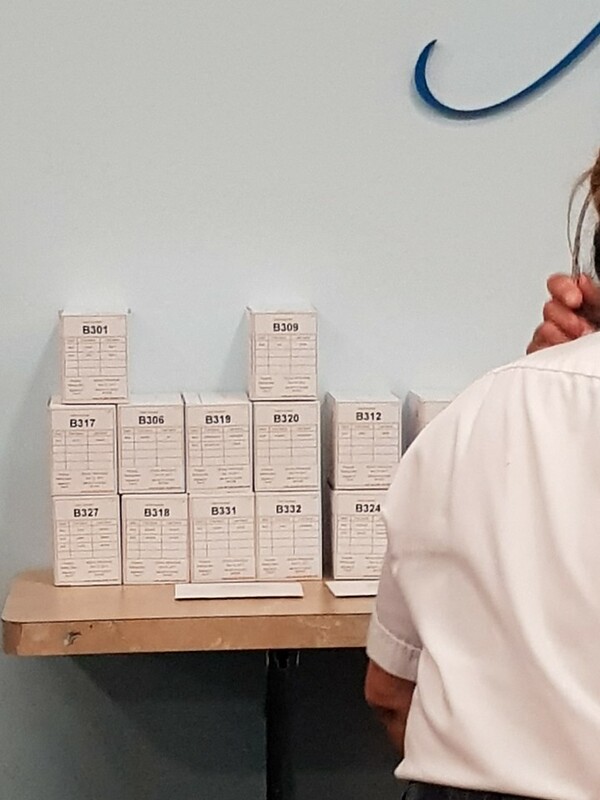 Even with picking up the Medallions, this was the smoothest boarding experience we had ever had on Princess or any other cruise line – it was less than fifteen minutes from kerb to ship! *Update 5th December* This is the same check in and boarding process whether or not you have received your Medallions in advance by mail. And, depending on volume of passengers, you may be directed to a waiting area/preferred lounge before boarding. Next, we will review our Ocean Medallion experience on the ship. Previous Previous post: The Princess Premier Beverage Package: the facts!